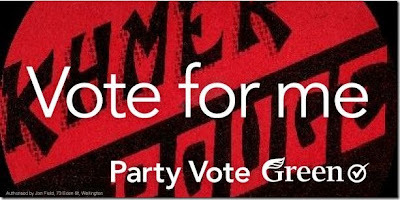 Peter Cresswell at Not PC has designed some honest billboards for the Green Party. Just bizarre Trev. 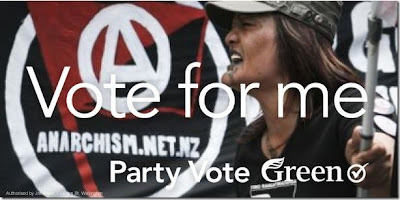 The banner in thw top photo, being anarchist, is obviously anti-Green Party. And I'm fairly sure the woman pictured isn't a Green Party member either. Satire is supposed to be plausible, y'know? I'm sure that many Greens would count themselves as 'anarchists'. Besides,the greens did support Te-Quadea did they not? What are you on about Asher? 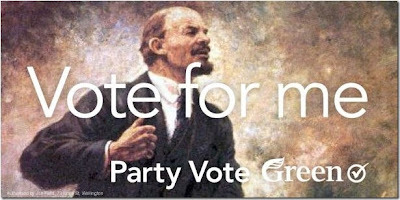 The Greens are the evil front to communism and are an open portal for Al Qaeda to come run their training camps here in NZ.